This is something we haven't seen very often in the past! It's a Tuesday slate, but there are still eight games. Generally, we have four or fewer games on a Tuesday, but the new NBA scheduled has blessed us with a bigger slate. 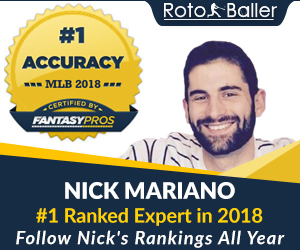 In this article, I will be providing you with my daily fantasy basketball lineup picks for DraftKings on 10/30/18. These DFS lineup picks can vary from higher-priced players and elite options to lower-priced players and value picks on DraftKings. 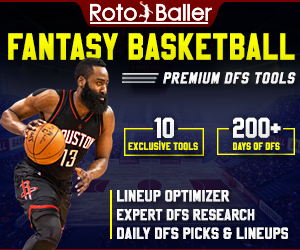 You can also check out today's FanDuel lineup picks and our Premium DFS Cheat Sheet. 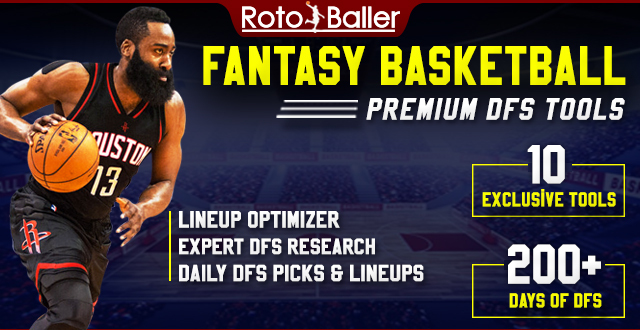 And don't forget to check out our brand new NBA DFS Matchup Ratings tool with daily player projections. As always, don't set your lineups to early and check player statuses prior to opening tip. Give me a follow on Twitter @BalesSJustin with questions or comments. Good luck everyone. The Houston Rockets will be without James Harden once again, leaving CP3 to take over the offense. The Rockets were blown out in their last game without Harden, leaving Paul to score only 33 fantasy points. He will play minutes in the mid- to high-30s tonight, though, and he comes with quiet triple double potential. CP3 may see lower ownership after disappointing fantasy owners in his last game, and that is something to take advantage of tonight. Beal is coming off of two bad games, but he continues to enjoy a great season. Through six games, Beal is averaging 23.5 points, 4.5 rebounds, and 3.2 assists in 32.1 minutes per game. He has seen a 28.1% usage rating this season, as well. Beal is averaging 1.16 fantasy points per minute this season, and he's expected to play minutes in the high-30s tonight. He's a solid option, and can be considered in all leagues in this matchup. This pick may be a bit of wishful thinking. Nance has seen an increased role with Kevin Love injured. He has played 23 and 28 minutes in his last two games, scoring 39.5 and 32 fantasy points in those games, respectively. Without Love in the lineup, Nance is averaging 1.4 fantasy points per minute. The Cavs recently figured Tyronn Lue, and they may choose to give Nance extra minutes. While that's far from a guarantee, I'll take the risk in what should be an extremely fast paced game. Green is another player that has seen an increased role with Harden injured. In his last game, he needed only 23 minutes to score 27.75 fantasy points. He struggled with fouls in that game, though, and could see upwards of 30 minutes tonight. He's a player that can score fantasy points in a hurry when he's playing well, and this game should feature plenty of scoring. Green is entirely too cheap, and he can be used in all leagues. Steven Adams is questionable tonight, and Noel would draw the start if he's out. In his last start, Noel scored 52.75 fantasy points in only 26 minutes before suffering an injury to his ankle. He's averaging 1.44 fantasy points per minute this season, and he gets a solid matchup against the Los Angeles Clippers, who have struggled against bigs this season. Keep in mind, Noel is also questionable tonight. If both of these players are out, Patrick Patterson will become a must start player.